What Lola wants, Lola Gets…. Last night we had our first experience with a Tom Douglas restaurant here in Seattle and I think if the rest of Tom’s restaurants are anything like this, we’ll be checking more out. Lola participated in last nights Dining Out For Life event which donated 30% of the bill to this great cause, which is how we decided to head out there on a random Thursday night. The atmosphere is cool and airy with very tall ceilings and great booth seating. One of the ManPanda’s peeves in dining out is small cramped spaces at high-end restaurants but Lola didn’t let us down. The meal was sublime from start to finish. I started off with a Kentucky Sour cocktail which had Dry Kumquat soda in it – just a unique taste. My partner and our other dining companion had Retsina which we learned is a fascinating white wine that has a pine resin in it. Quite refreshing and tastes way better than it sounds. The meal was full of vibrant full bodied tastes from the selection of dips and pita to start, to the absolutely bold and over-seasoned (this is a compliment coming from the ManPanda) Oregon hangar steak with rhubarb chutney, hazelnuts, and ginger. Raw slices of cow covered in a mesmerizing mix of spices…do I taste Cinnamon, Cumin, Mace?? Just awesome. By desert the taste buds were a bit dulled by all the beverages but the Loukoumades my god, I believe I remarked to the waitress last night that this was the single best desert I’ve ever had. Gooey, honey covered doughnut like hunks of dough on a plate. Simple, but just amazing. 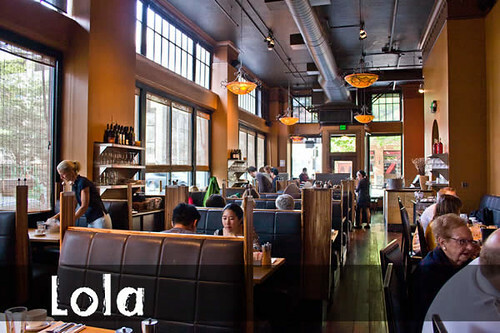 Last nights visit to Lola will definitely incite further exploration of the Tom Douglas empire here in Seattle. Judging from the foods last night, I think it will be a very pleasant exploration! One odd note. They do serve LAMB HEART skewered on a pike. Perhaps this isn’t the place to bring Grandma on Easter.